EMS vendors without an OMS strategy will lose ground as better-equipped competitors take market share. Boston, May 12, 2016 – Regulations and market complexity make it expensive for some execution management systems to maintain market share, much less grow, while well-positioned order management systems vendors have figured out how to bolt on an EMS that can meet basic requirements. In doing so, they call into question the viability of stand-alone, nonintegrated EMSs, just when many EMS vendors are having a difficult time upgrading to a truly multi-asset trading platform. Still, regulatory drivers and market complexity will continue to enforce a need for robust trading solutions. 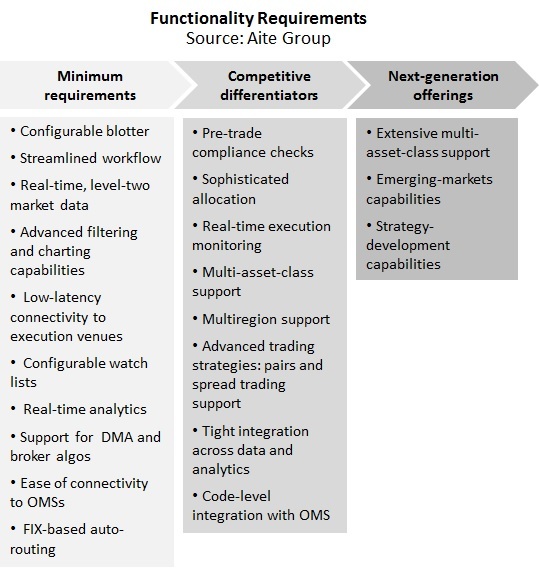 Only a subset of vendors will possess the resources, capabilities, and fortitude to succeed in the next era of global multi-asset electronic trading. This report examines key trends driving the prospect for EMS market growth and highlights a select list of vendors and brokers that are actively competing for market share. It is based on an Aite Group survey of 11 EMS vendors from October 2015 to April 2016 as well as product demos and follow-up interviews, and it profiles EMS offerings from Bloomberg, Convergex, Eze Software, Fidessa, Flextrade, Instinet, ITG, Morgan Stanley, Portware, REDI Global Technologies, Tethys, TradingScreen, and UBS. This 72-page Impact Report contains 22 figures and 14 tables. Clients of Aite Group’s Institutional Securities & Investments service can download this report.